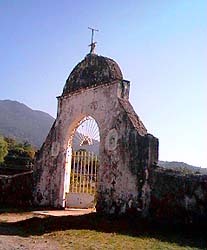 Old Trujillo Cemetery, looking West. 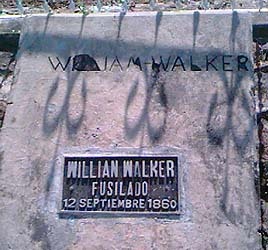 In the Old Trujillo Cemetery lies the body of William Walker. A native of Nashville Tennessee, William studied law, was a lawyer and a journalist. He must have had the need for adventure, because in 1853 he convinced a group of men to come with him to Baja, California and take it from the Mexicans. He was driven out. A few years later he was luckier; in 1855 Walker was invited to try his hand at infighting on the liberal side in Nicaragua. Again, with only a handful of followers he attacked Granada and won. In less than a year he had himself elected president of said country. He instituted slavery to ingratiate himself with the Southern states of the USA and made English the official language. Foolishly, he seized Cornelious Vanderbilt's railroad and decided to take on the remaining Central American countries. These countries united against Walker and his followers, and with the financial support of Vanderbuilt, succeeded in defeating him at Rivas in 1957. William eluded his fate by getting picked up by the US Navy and deposited back on US soil. A lesser man would probably take up chess or have a family, but not William. Six months later he sailed from Mobile, Alabama. He made it to San Juan del Norte (Greytown), where he got himself arrested and returned to the USA. William was not daunted. In 1960 he sailed again with the intent of pestering the Central Americans, but it was here that he made a fatal mistake; he landed in Trujillo. After many altercations, the British Navy turned him over to the Honduran Government. On September 12th, 1860, William Walker was put up against a wall and shot. Let that be a lesson to all slick entrepreneurs who think they can come to Trujillo and make a fast buck!